Anna is a professional animal communicator who has received advanced training through the Assisi International Animal Institute in California, USA and has been practising for 18 years in South Africa, Europe and the USA with domestic and wild animals. Her conservation experience includes working with cheetahs, lions, wolves, baboons and elephants in educational and rehabilitation programmes. Anna's goal is to raise awareness and advance the relationships among humans and other species, on both the personal and spiritual levels. 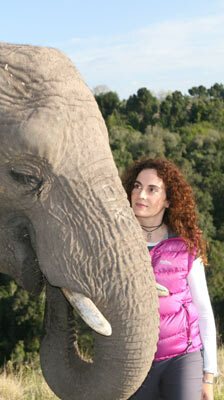 She’s also the subject of the documentary movie “The Animal Communicator” released in 2013. In her communication and conservation work, Anna lives her personal mission of being a voice for the animals and the wilderness. I had tears in my eyes whilst reading your consultation feedback as it was exactly what I experience with my animal. I shall continue with love and deep respect for my special little healing companion and trust that he will guide me further as to the best way forward. Bless you Anna for being so beautifully open to his highest self and thank you from the bottom of my heart for the work you do in this world.